Home→Readers Heartworm Stories→Zeva’s Heartworm Treatment Story, A Modern Miracle! Zeva’s Heartworm Treatment Story, A Modern Miracle! This is the story of Zeva, a little Pug, rescued by Heartworm Treatment For Dogs reader, Kathy. I think when you read it you will agree that this story is a modern miracle. We hope that Zeva’s story will be found by other worried owners searching on line for information available on the safety of heartworm treatment with Immiticide in pregnant dogs. Read Zeva’s amazing story below. A man was mowing his pasture with a Bushhog and almost ran over her as she was in the grass and so weak, that all she could do was to hold her head up. The little dog was starving and the man kept her for two weeks and tried to “fatten her up”. When Kathy rescued this little stray pug, she was found to have a bad eye, was missing part of an ear, was covered in fleas and ticks and was positive for heartworms. “We immediately treated her heartworms, got antibiotics for her eye and also used Panacure. After 21 day aspirin treatment, we returned to the vet for a recheck and found out she was pregnant! I couldn’t find any information as to the safety of using the Immiticide on a dog that was pregnant. 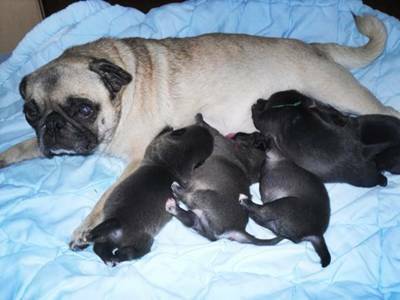 On October 3, 2011 Zeva gave birth to 5 puppies, three girls and two boys. I did have to break all the sacs and tie the umbilical cords as pugs are unable to do that. 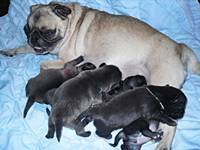 At the time of publishing this article, complete with the pictures Kathy and her daughter sent to me (taken October 18, 2011), Zeva and babies are doing great, the pups and growing leaps and bounds. All of them now have their eyes open and several are already walking – no wonder Zeva is yawning in the picture below! 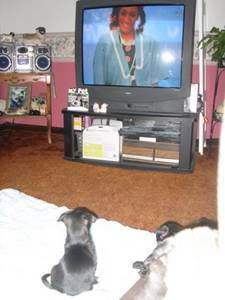 Kathy sent me an update on the 30th November 2011, the puppies were all eight weeks old on the 28th. As you will see from the pictures, Zeva is a wonderful mother and you can see how much the pups have grown since the earlier pictures – but I am sure she is glad that the TV seems to provide some of the entertainment so she gets a rest sometimes! I think you would have to agree that this story is a real miracle! Zeva must be a very special little dog with a tremendously strong will to survive all that she has gone through – and what a blessing that she now has a wonderful home with Kathy. Thank you, Alison for printing Zeva’s story. 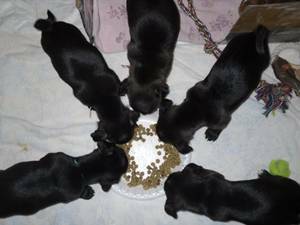 The puppies continue to do well and are 16 days old as of this post. They are becoming more active every day. Zeva is a good mommy and she will never live the life she had before, we will see to it that she lives like a queen! Please adopt not buy and spay/neuter your new family pet! Kathy, thank you for sharing Zeva’s story and the lovely pictures – and please keep us updated on how she’s doing – and the puppies too. I was so very happy to find this article. I currently have a pregnant boston terrier that I rescued from a shelter, treated for heart worms with immiticide, then found out was pregnant. She has “at least 4” pups with hearts beating and we’re praying all goes well. Like you we had no idea she was pregnant and we have no idea what type of dog she has been bred by. Please pray for our precious Ruby that all may turn out as well as your sweet story of Zeva. I work in our shelter’s clinic. On 12/23/11 we started Heartworm treatment on a stray that was malnourished (body scale 2/9), had hookworms, whipworms and heartworms. The intestinal worms had been treated prior to treatment. Then a week later it became obvious she was pregnant. On 1/11/12 she delivered 4 apparently healthy pups. Now 7 weeks of age and so far no known problems. As I have personally adopted one of the litter I’m saying my prayers, and have my fingers crossed, because we really do not know.